4Easysoft Mac WMV to MP4 Converter is one top WMV to MP4 converter Mac software being able to convert WMV to MP4, H.264/MPEG-4 AVC, MOV, H.264 AVI, M4V, DivX, XviD, HD AVI, DivX HD, XviD HD…video/HD video on Mac supported by various portable devices. Meanwhile, it is possible for you to extract audio from WMV files to MP3, AAC, M4A, AC3, OGG etc on Mac. 4Easysoft Mac WMV to MP4 Converter helps you to customize video by adjusting video Brightness, Contrast and Saturation, modifying output settings, checking Deinterlacing, do video trimming and cropping etc. And with our cool WMV to MP4 converter for Mac users, users can add watermarks and subtitles to the videos; also users can select output audio tracks. This cool software also supports batch processing which allows you to output different formats simultaneously. 4Easysoft Mac WMV Converter is devoted to convert mainstream video, HD video formats to WMV files like convert FLV to WMV on Mac, convert AVI to WMV, convert MPEG, MPG, ASF, MOD, VOB, HD MP4, HD WMV to WMV etc on Mac. 4Easysoft Mac WMV to MP4 Converter is devoted to convert WMV to MP4, H.264/MPEG-4 AVC, MOV, H.264 AVI, M4V, DivX, XviD, HD AVI, DivX HD, XviD HD…video/HD video on Mac. 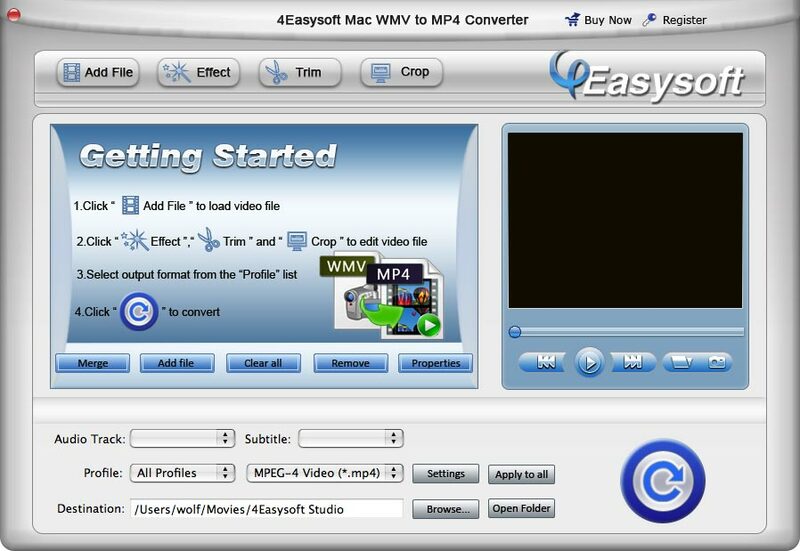 4Easysoft Mac WMV to MP4 Converter makes it possible to extract audio from WMV files to MP3, AAC, M4A, AC3, OGG etc on Mac. 4Easysoft Mac WMV to MP4 Converter can make WMV files successfully being played on many devices like iPod, iPhone, PSP, Google Phone, Sony Walkman, Archos, Creative Zen, iRiver, BlackBerry, BlackBerry Storm, BlackBerry Bold, Palm Pre, Motorola, LG, Sony Ericsson, Mobile Phone, etc. More professional settings could be found in Settings window where users can edit video Encoder, Frame Rate, Resolution, Bitrate and audio Encoder, Channels, Bitrate, Sample Rate. Press Save as.. to keep all parameters for next use. Use Trim to select any segment from the source file you need to generate and crop the video to reduce or get rid of the black strips to expand the size of play region. The "Merge into one file" assists you to join several separated files to a whole one. 4Easysoft Mac WMV to MP4 Converter allows instant previewing the effect. Meanwhile, pictures could be captured from the movie with three formats to generate: JPEG, GIF, BMP. 4Easysoft Mac WMV to MP4 Converter is absolutely easy to handle. Even beginners can master quickly.